A hurried wartime wedding was probably not what Rene Duncan had pictured for herself. But necessity and austerity brought about a private ceremony at the Beaufort Methodist Church parsonage. And a week later Rene and Ron were married, on 22 November. They celebrated in Beaufort that night with a bowl of cherries. Rene had first noticed Ron at a raucous ‘tin-kettling’ party and dance for a newlywed couple. Ron was quiet and shy, and new to Beaufort. He had just started work as a grocer’s assistant at the Burrumbeet and Windermere Farmers’ Cooperative, known as “the B and W”. The B and W was a short walk from the Duncan family home. Rene’s father would have known the manager, as they were both returned soldiers. Rene took her friend Edna Gilligan with her to the Co-operative, two girls going to check out the new grocer’s assistant. While there Rene and Edna bought some boiled lollies. The lollies were stale so the girls took them back to the store, but the replacement bag of lollies Ron sold them was just as stale. After this inauspicious meeting Rene and Ron started courting. Ron was from a Windermere farming family. 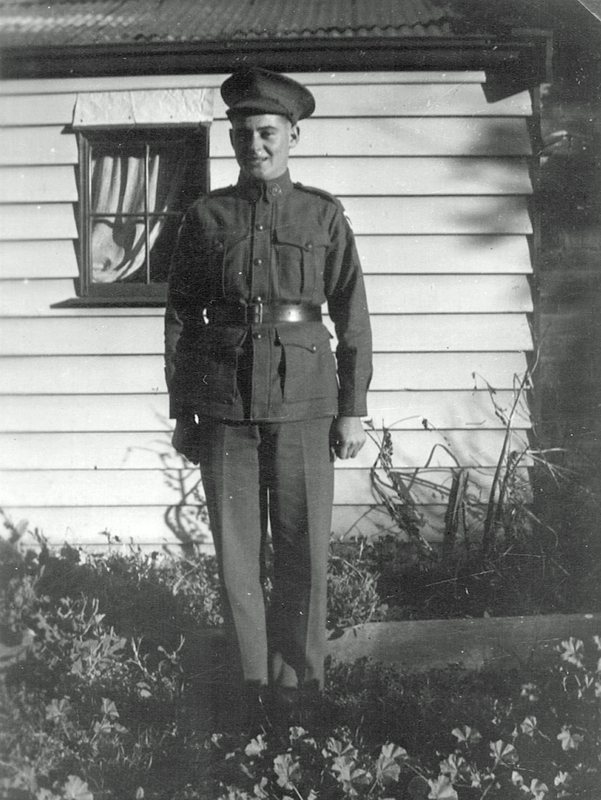 Each week he cycled 20 miles from Windermere to Beaufort to lodge for the week and work at the B and W.
Ron had volunteered for the part-time Citizen Military Force in October 1940, joining the 4th Light Horse regiment. Through 1940 and 1941 Ron underwent training in camps around the Western district of Victoria. When not with his unit, Ron was back in Beaufort or at the Windermere farm. The story goes that the engagement and wedding took place while Ron had a 10-day leave pass. Ronald Andrew Palmer circa 1940. From the author’s collection. Copyright Andrew Palmer. 1941 Certificate of Marriage, Methodist Church marriage register no. 18. Beaufort, Victoria, 22 November 1941. Featured image: Ronald Andrew Palmer and Mavis Irene Duncan circa 1941. From the author’s collection. Copyright Andrew Palmer.